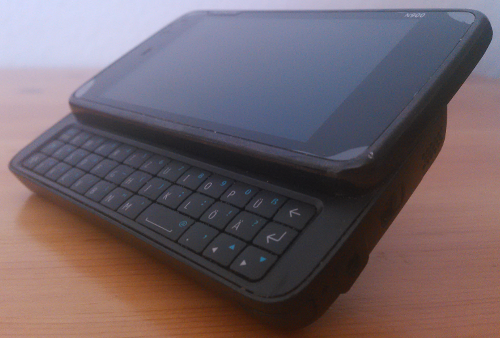 Yesterday I randomly stumbled upon my trusty old N900 in a drawer and decided to charge it and revisit past times. Maybe I am becoming older and more nostalgic and this is clouding my judgement but I feel that in 2009 mobile devices had more character. Booting up the N900 and being greeted by the familiar but nowadays seldomly heard Nokia jingle followed by a actually usable mobile Linux distribution makes me feel right at home in a way that today’s devices - in my case a Jolla with a TOHKBDv2 external keyboard - somehow simply can’t. While the Jolla may have much faster hardware, a bigger screen, multipoint touch and shiny fluid animations it just doesn’t measure up to the old Maemo devices when the primary use case is to have an actual mobile computer instead of a communications gadget. The first and foremost problem is of course the lack of hardware based user interfaces such as unlock sliders, camera protectors, buttons and of course hardware keyboards. While the latter is at least partially solved by the TOHKBDv2 external keyboard I helped fund last year and received two months ago it - like everything else concerning the user interface - is just not as good as what was already available as a complete package back in 2009. To prevent misunderstandings: I am very grateful for the work Dirk et. al. did with FunkyOtherHalf to produce a usable external keyboard for the Jolla in a very limited production run of only a few thousand devices. If you view it as what it is - a prototype - it actually exceeds all expections one could have reasonably had. But sadly this does not change the reality that at least my other half keyboard is not consistently usable in a day to day fashion. The magnet based connection between the keyboard part an the backcover of the Jolla is rather flaky and sometimes requires reconnects during usage. Furthermore some keys, in my case U and N, don’t work as well as the other keys which frequently disrupts the flow of typing. If you were to disregard these issues, the keyboard itself, especially the layout, would be better than the N900’s - sadly only in theory as its slider mechanism and feel of use in practice is still superior. Of course the Jolla has its strengths: SailfishOS is a pleasure to use1 and the faster internals are essential to using it without having to wait on the device every other interaction. Also the replacement of GTK with Qt’s QML as the primary UI framework was definitely the right step and being able to execute Android applications is useful for when there is no SailfishOS counterpart. But while slow the N900 is superior in other situations such as direct sunlight and precision usage using a stylus. The transreflective background of the display means that one can turn off the backlight completly if the sun is shining bright enough and use it as a source of light whereas the Jolla display is often not readable in bright sunlight. While SailfishOS is more fluid and looks nice, Hildon with all transitions turned off feels quick in a way that an animated UI simply does not. Add to that the various unlock methods such as sliding out the keyboard, sliding back the camera protector or sliding the unlock button and the daily usage of the N900 feels more intutive and quicker than any touch based interface I’ve tried. This problem is increased by the recent SailfishOS UI overhaul that replaces gestures with buttons in various parts of the interface. Many of the nice properties of Jolla’s interface such as sliding from the top of the display to lock and sliding up to access the application menu from the lockscreen now have to be patched back into the UI using custom repositories. Admittedly it is great that this is even possible without requiring deep changes to the system such as jailbreaks as in other mobile systems. Furthermore with the right set of patches from the Warehouse it is possible to e.g. enable nearly system wide landscape mode support which is very nice. What this all boils down to is that the best device for me today would be a N900 from 2009 with updated internals2. 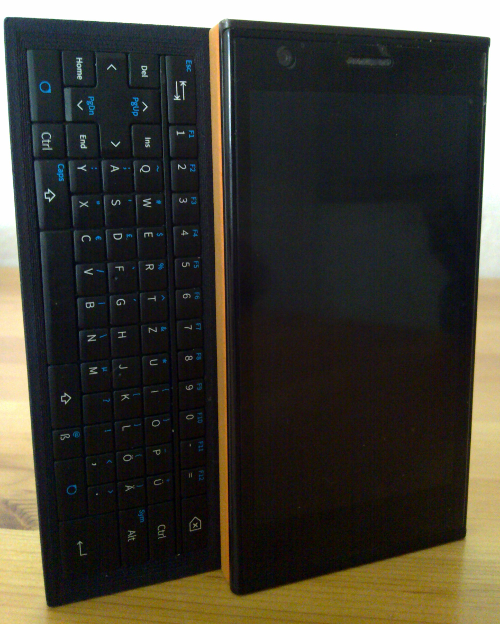 However there is not really any question that the Jolla is the better Smartphone and more painless in day to day usage3 but the N900 is still the better if not only mobile computer. Contrary to the Jolla it feels natural to use CLI applications in Hildon, ticker with the system and use it like I use my laptop - until I have to wait for the dated hardware to finish computing what to do about my press on the close window button.